Happy fall, all! To commemorate all those squirrels hiding away their winter victuals (is it victuals or vittles? 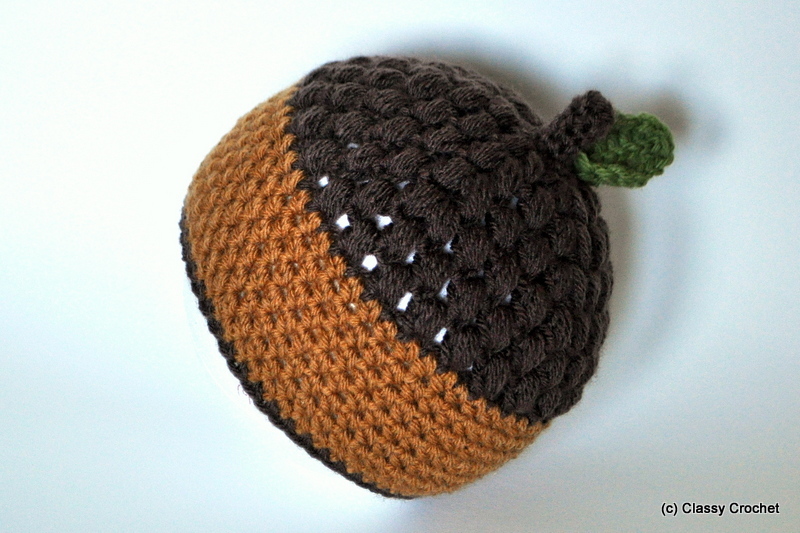 Apparently urbandictionary says they mean the same thing), here’s an awesome acorn hat pattern for that little nut in your life! Get yours on Ravelry, Etsy, or Craftsy today and hurry up and go enjoy that fabulous fall weather! Y’all. Thanks so much for your comments and feedback – I had no idea you would all find this little rectangle hat as cute as I did. 🙂 Due to overwhelming popularity and feedback, I am now offering a PDF download of the pattern in THREE additional sizes (3-6 mo, 6-12 mo, 1-3 yrs). If you simply don’t feel like doing your own adjustments, I’ve done them for you! I’ve also included a few additional photo instructions for clarity. ALL this for a fabulous discounted price, since I’m leaving the free pattern up below. You can find it on Ravelry, Etsy, or Craftsy today. Hooray! Thanks again and happy fall crocheting everyone! Happy September! I’m writing this from my hometown in upstate New York, where September automatically meant the beginning of a new school year. I mean… it always kind of mentally means the beginning of a school year for me still, even after 5 years+ after I attended my last class ever, but it’s much more prevalent when I drive by my high school every day and see all the same ads for the same back to school sales at the same malls where I shopped when I was twelve. September in upstate New York also always immediately means cooler weather. For example, today, on the first day of school, it is currently 57 F outside. 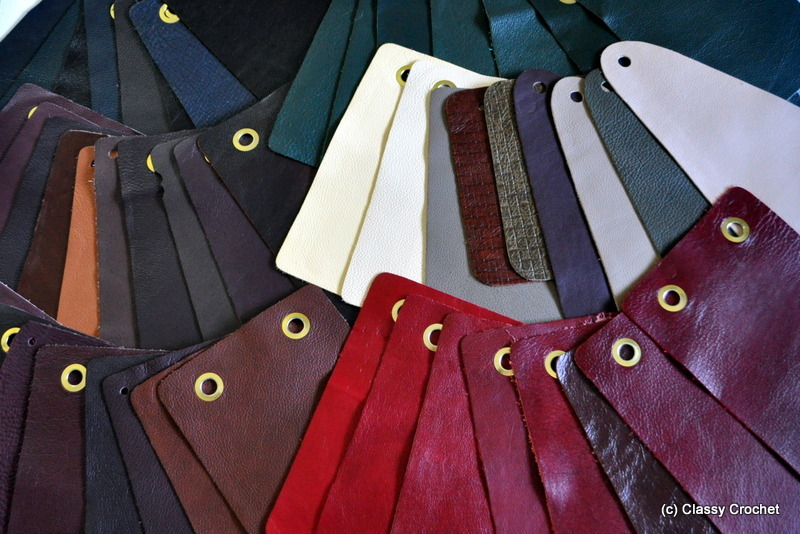 That means one thing – time to start making more fall hats!! This hat is really easy. I know I say that about all my hats, but seriously. 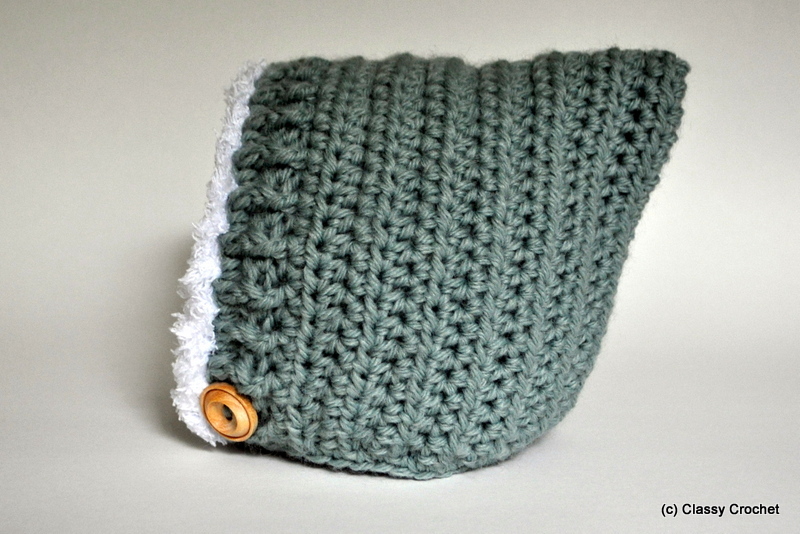 If you’ve never made a hat and the extent of your crocheting skills is a dishcloth, then this is the hat for you! 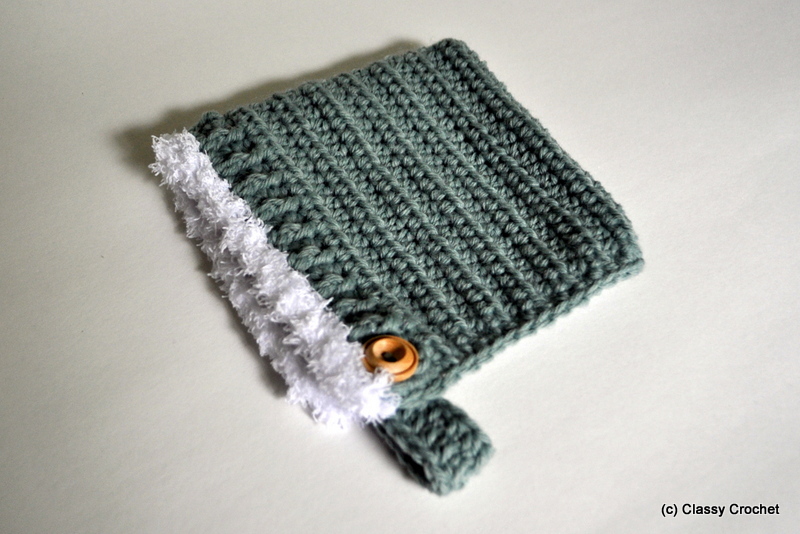 It’s a dishcloth folded in half and sewed down the back. The end. The natural curve of the baby head creates the adorable little peak at the back. See? It’s just a rectangle folded into a square. Easy peasy. I use a fpdc/bpdc ribbed edge, the same one in my *other* elf pixie hat, but if you’re a beginner and don’t want to deal with fussy new stitches, just skip the fpdc/bpdc row and leave the dc row as is. 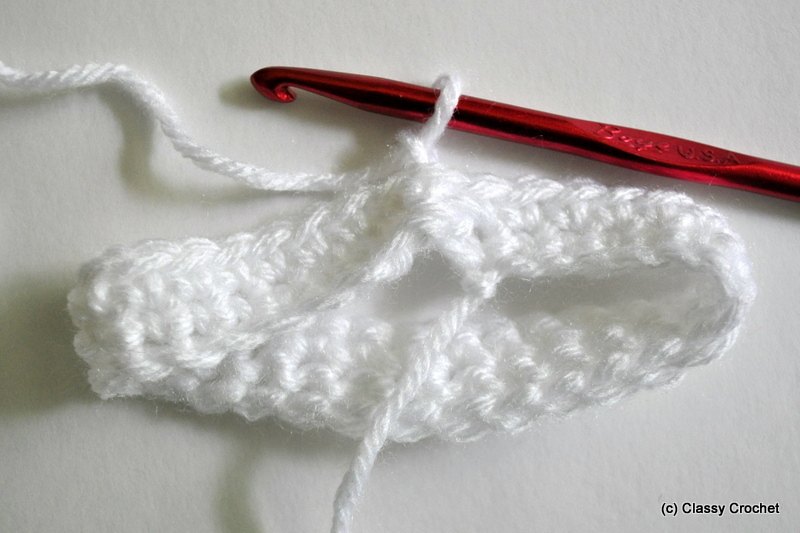 You’ll have a cute border with the fluffy yarn anyway. I wrote this pattern up in a 0-3 month size, but you can easily adapt it by increasing the width of your hat. I’m in the process of writing up more detailed sizing to publish at a discounted price in the very near future – stay tuned! I used Lion Brand Wool-Ease (Seaspray) for this pattern. 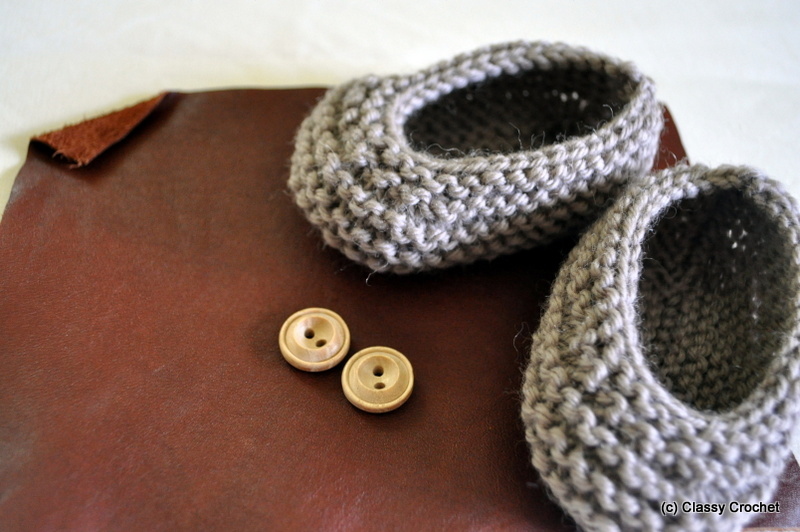 I like Wool-Ease as a worsted weight yarn, especially for knitting, because, like the Thick n Quick, it’s a great blend of washable acrylic and wool to give it that nice vintage feel, plus it has the greatest ‘natural’ palette. 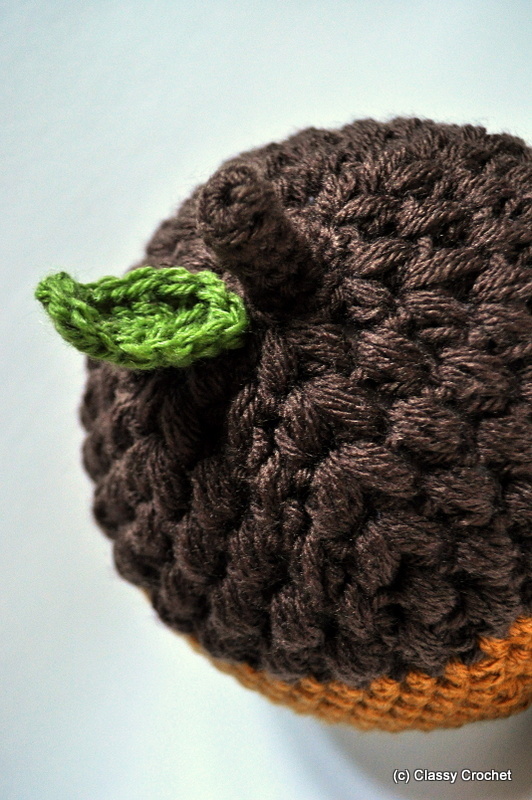 I think woodland elf hats should be made of earthy colors. The furry trim gives this hat the knuckle-biting cuteness factor. Obviously it’s optional (the hat looks just as woodlandly authentic without it) but c’mon. Fur. I’ve used Bernat Baby’s Pipsqueak, although I might even recommend Red Heart Buttercup, since it’s a bit fluffier. I’ve usually only found blinding white, but recently discovered Pipsqueak in “vanilla”, which I think matches better with browns. Anyway, use whatever you can find. I used an H hook for the hat, J for the fur trim. Row 1: ch 43, skip first 2 st, 1 dc into each ch. (41 st) You could also do chainless foundation if you wanted, but I actually find that the tighter tension of the ch foundation gives the edge a better curve around the baby face. Row 2: (you can skip this row if you don’t want to deal with fpdc/bpdc) ch2, alternate fpdc and bpdc into each dc, creating the ribbed edge. Row 3-13: ch1, hdc into each st. 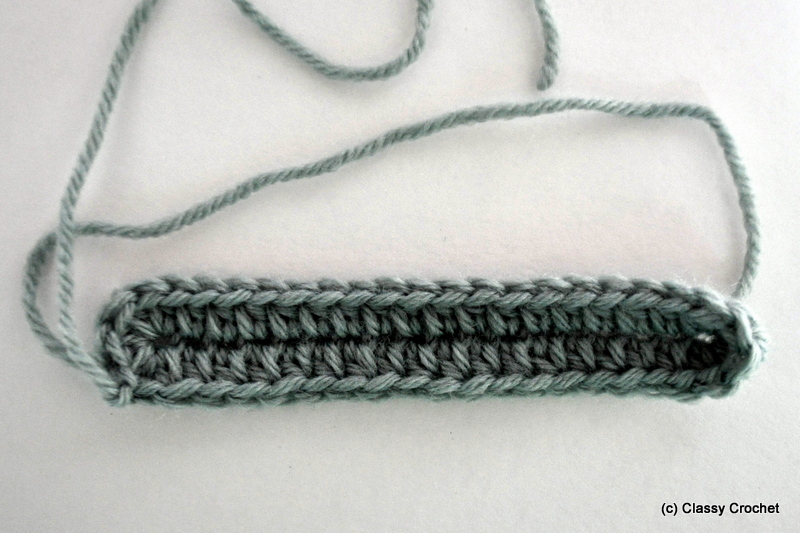 When you reach the end of each row, ch1, turn, hdc into the same st, hdc into each st, etc. Your gauge might be different than mine and you might need more or less rows. Basically you want a rectangle that folds in half into an exact square. I test by folding in half, then folding the square(s) into a triangle to see if the edges line up. It’s left over from my origami days. When you reach your desired length, fold the hat in half. 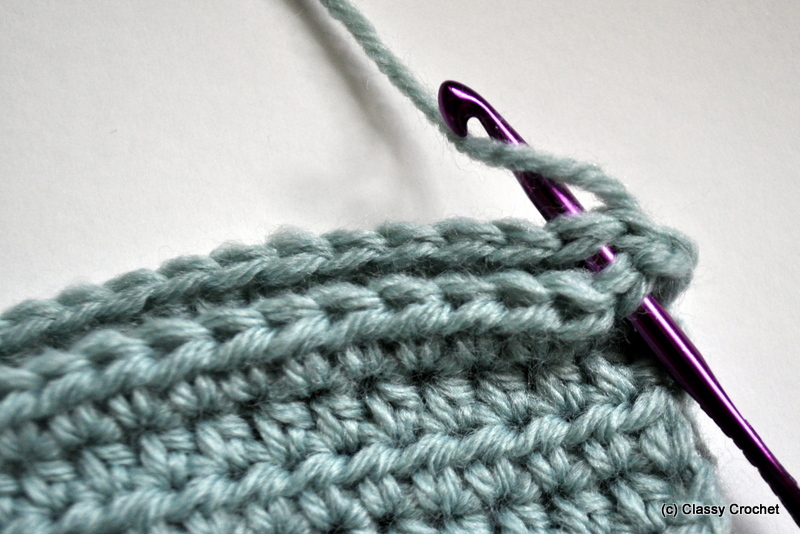 Insert your hook into the last st on the folded side, wrap yarn over, and draw yarn through all loops (sl st). Insert hook through first st on opposite side to begin sewing. Matching up remaining stitches, insert hook into front st, then back st. Wrap yarn around, and pull through all loops (sl st). Repeat for remaining stitches. You’ll have a row of sl st along the inside edge. 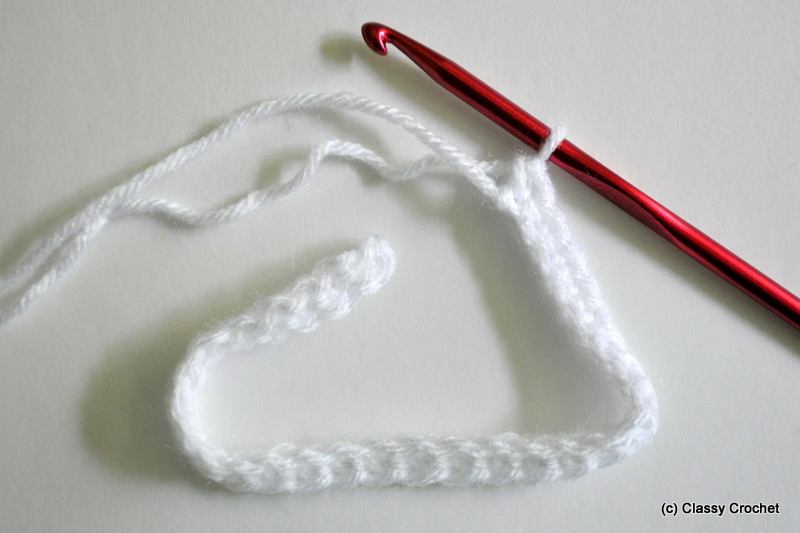 You might have a stitch left over at the end where the fold is – thankfully crochet is forgiving and you can just sew around it. 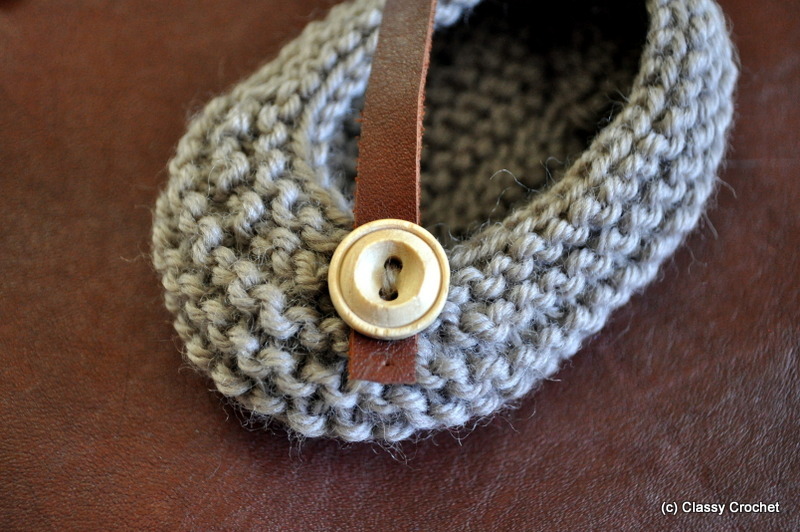 Fasten off yarn and weave in ends. Turn hat right side out. 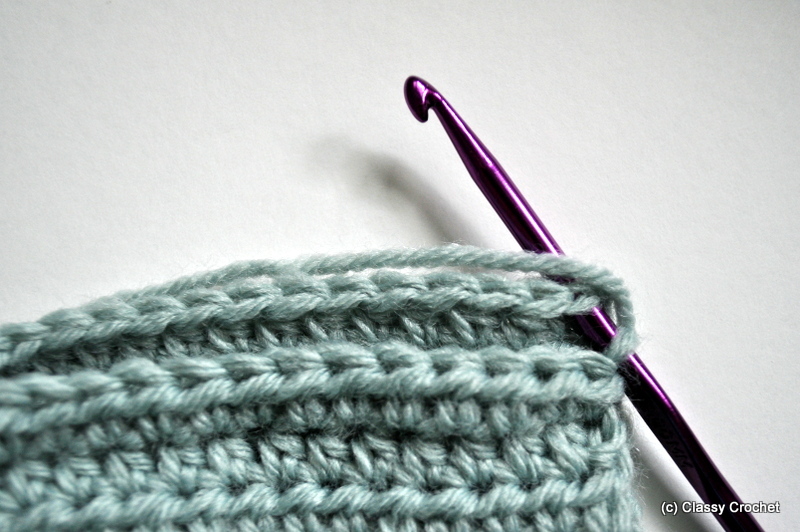 Fur: using J (or larger) hook and fluffy yarn, sc into the ribbed edge. When I first did it, I sc into each st and the brim of the hat flared out a little. Since I am picky, I went with a larger hook and skipped every other sc for the hat in these photos. You can do whatever you want to get the nice fluffy look of your dreams. More options: To create a nice finished look, I like to sc around the bottom border of the hat. It’s completely unnecessary but it’s pretty. If you do, make sure to only sc one st into every row, otherwise the bottom kind of flares out and doesn’t wrap around the head as snugly. Chin strap: You can do a chainless foundation of dc (about 15-18 st long), or I liked mine a bit more tightly woven, so I just ch18, 1 hdc in each st down one side, 5 hdc into the end, hdc down the other side, 4 hdc into the end and fastened off. Leave a tail at the beginning and the end so you can sew one end to the hat, and use the other tail to sew the button onto the strap. 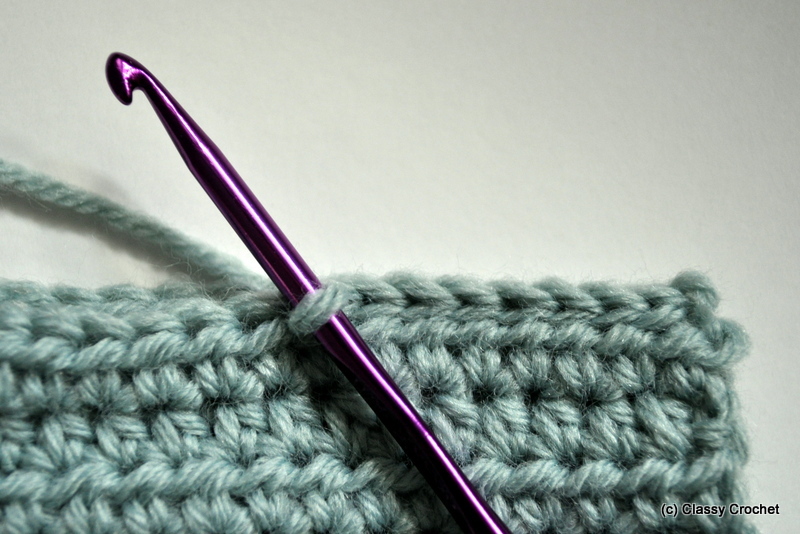 Another marvelous aspect of crochet is that the stitches are large and loose, meaning you don’t have to stitch in a buttonhole, you can just button it up wherever the button fits through on the brim. Automatically adjustable chin strap = win. 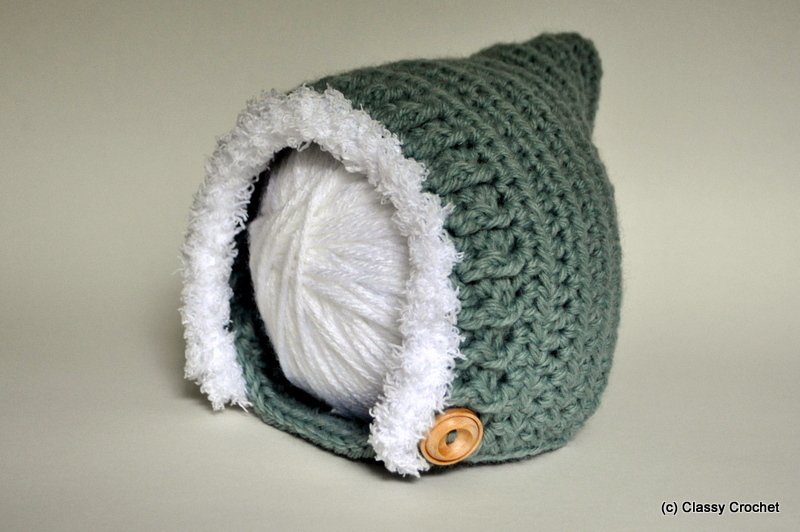 Sew button to strap, sew strap to hat, weave in all ends, place on baby head and admire adorable woodland elf cuteness. Yay cuteness! I have a confession to make: close on the tails of my yarn addiction is my ribbon addiction. It’s mostly fueled by a discovery several years ago of a RIBBON FACTORY in Hagerstown, MD from where I used to live in Virginia. The possibilities of ribbon decor are endless, but not the price – $5 for 10 yards at your local big box hobby store? No thank you. But, BUT… the Berwick ribbon factory gives their castoffs, remnants, and extras a very honorable resting place in the attached outlet store, where you can find 100 yards of 1″ grosgrain for – wait for it – $2. I know, right?? Anyway, I love ribbon, I love it as decoration, but when it comes to hats, it can be difficult, because hats are stretchy, ribbon is not, ergo, wrapping ribbon around/through a hat = nonstretchy hat. Kind of defeats the purpose. 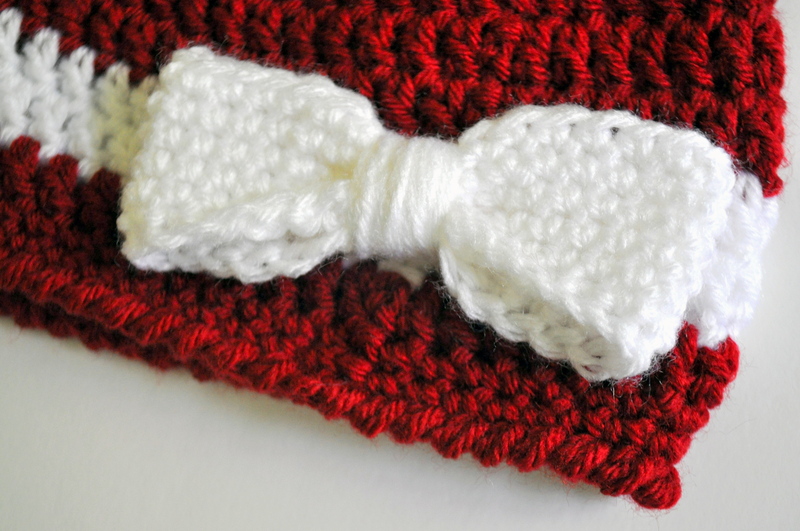 Enter simple solution: crocheted ‘ribbon’ and bow right on the hat! Huzzah! Once you master the art of making a basic double crochet hat, you can do a zillion things with them – my favorite way to get creative is to add appliques (flowers, butterflies, hearts, etc.) I used to experiment with different crochet stitches: fan, shell, lace, etc., and those are marvelous as well, but at the end of the day, I found that an unfussy, clean, simply decorated hat presented a nicer silhouette of the type of product I wanted to create. I almost always end my hats with a few rows of sc. It makes the band more snug fitting around the crown of the head. I’ve had many customers comment how this feature makes their hats super comfy/fit right, or actually stay on their babies’ heads when other hats fall off. 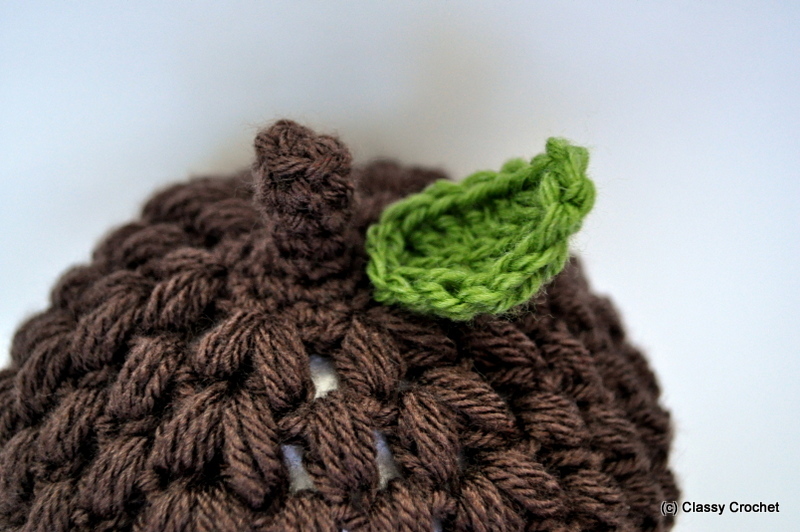 This particular pattern only includes instructions for one size, but the premise behind all crocheted hats are the same: two st in one = an increase in size. You basically make a flat increasing circle until you get the diameter you want, then just one st around until the hat is the length you want. Your gauge will be different depending on your hook and yarn weight, so the only way to know for sure how big your hats will be is to experiment. Feel free to jigger this pattern as you please and I’d love to see the results! 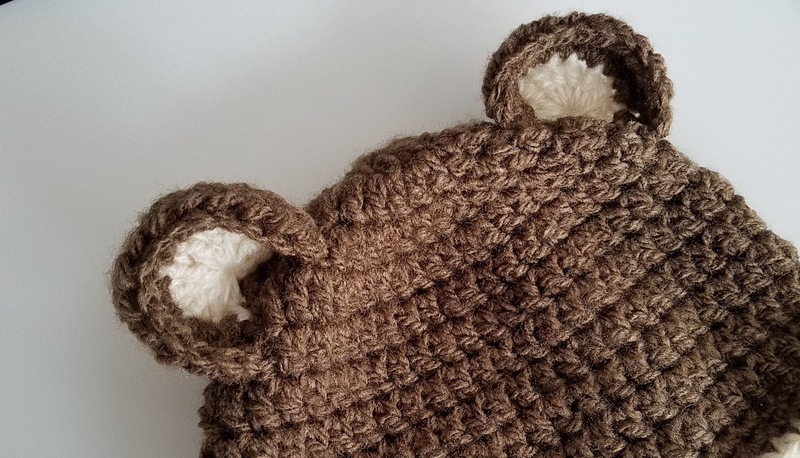 I took the liberty of writing out several different recommended baby hat sizes in my free striped earflap hat pattern, so feel free to download that and use it as a template for this hat if you want a different size. 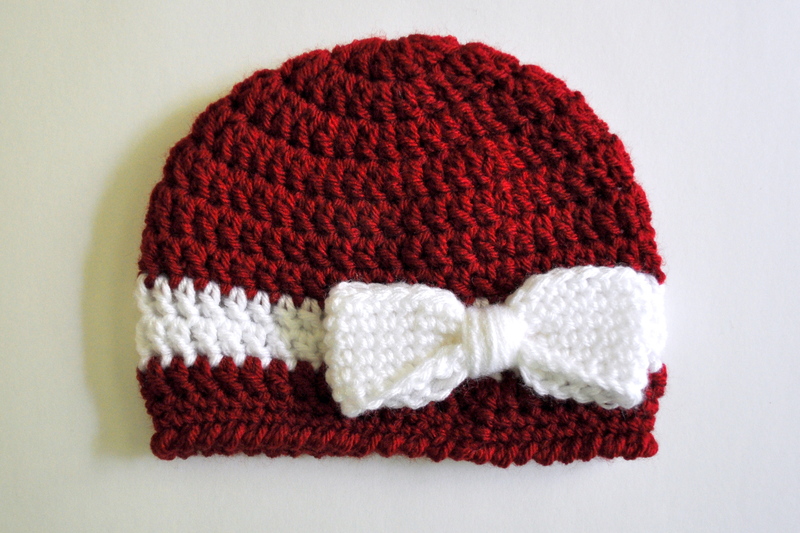 I used Vanna’s Choice yarn in two colors (hereafter referred to as “red” and “white” – I’m not big on labeling with letters when you can clearly see the red and white in photos) and an I hook for this hat. *second pontification: Vanna’s Choice is actually quite thick for a worsted weight – most worsted weight yarns recommend an H or I hook, while Vanna’s Choice recommends a J. Honestly it should be an aran weight yarn, but whatever. I’ve made hats with G, H, and I hooks and get over an inch difference in each size, so feel free to play around. My I hook resulted in a pretty decent sized baby hat, about 6-12 months. 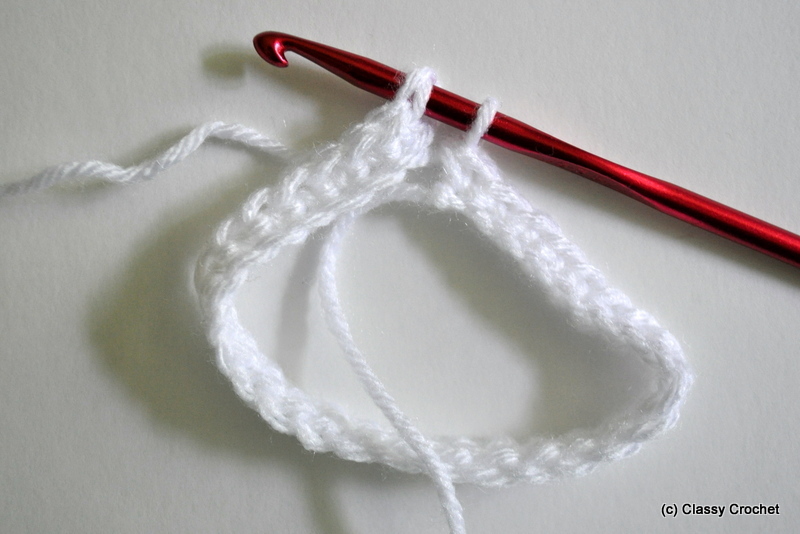 A thinner yarn (such as Caron Simply Soft) and an H hook would result in a newborn size. However you do it, you should end up with a hat sized to fit some baby at some point or another. Row 1: Using red and I hook, ch4, sl st to form loop. Ch2, 12 dc into loop. Sl st to first ch2 (12 st). Row 4: Ch2, dc in same st, *1 dc in next 2 st, 2 dc in next st* repeat from * around. Sl st to last st (48 st). Row 5-7: Ch2, dc in same st, 1 dc in each st all the way around. Sl st to last st.
Row 8-9: Switch to white. Repeat row 5 (1 dc in each st all the way around). 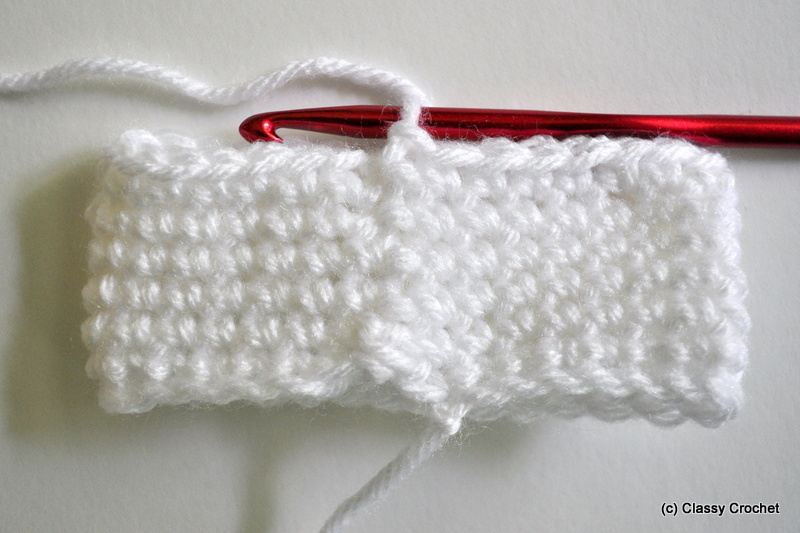 Sl st to last st.
Row 10: Switch back to red (carry it up from the white, no need to cut your yarn). Repeat row 5. Row 11-12: Ch1, sc in same st, 1 sc in each st all the way around, sl st to last st.
Row 13: Ch1, reverse sc all the way around. (Click here for tutorial.) Fasten off and weave in ends. Using white and I hook, ch 33. (Leave a 6-8″ tail to sew up the bottom.) Skip first st, sc into each st. You could also use chainless foundation, but I find it a little finicky with sc. Plus, nobody can tell the difference for this project. Sl st into the top loops of the first sc, being careful not to twist your stitches. You’ll now have a loop and will be basically sc a very wide, flat cylinder. Ch1, sc in first st, 1 sc in each st all the way around. Sl st to the first st at the end of each row. Repeat until you have 6 total rows of sc. Do not cut or fasten off. 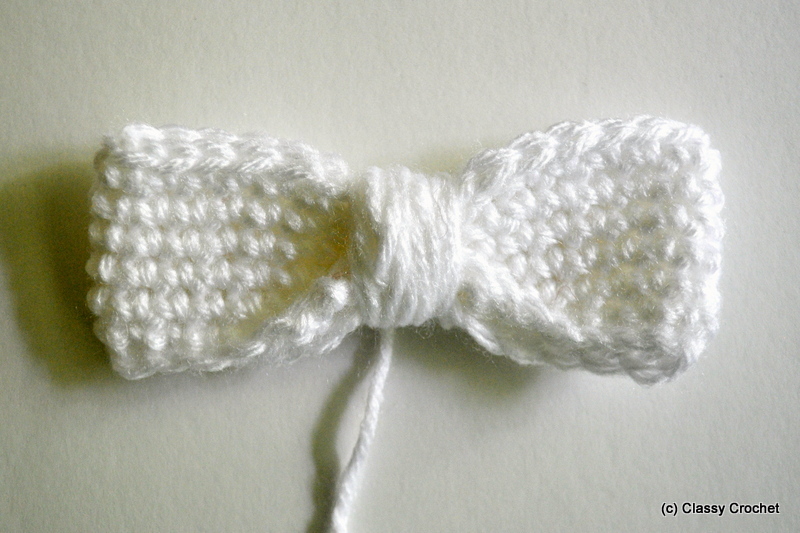 Use the bottom tail to sew up the bottom of the bow. Take your yarn and wind it several times tightly around the center of the cylinder to create your bow – this will determine how much you need before you cut off the final length. Wind it until you like how it looks, and add a few feet to sew the bow onto the hat. NOW, cut off yarn and fasten off. Using a tapestry needle, sew the end through the back a few times to secure it, then sew the bow onto the hat. I like the sew all my appliques directly over the seam of the hat – that way if the wearer wants to put it on the right or left side, the seam isn’t running down the middle of the forehead. 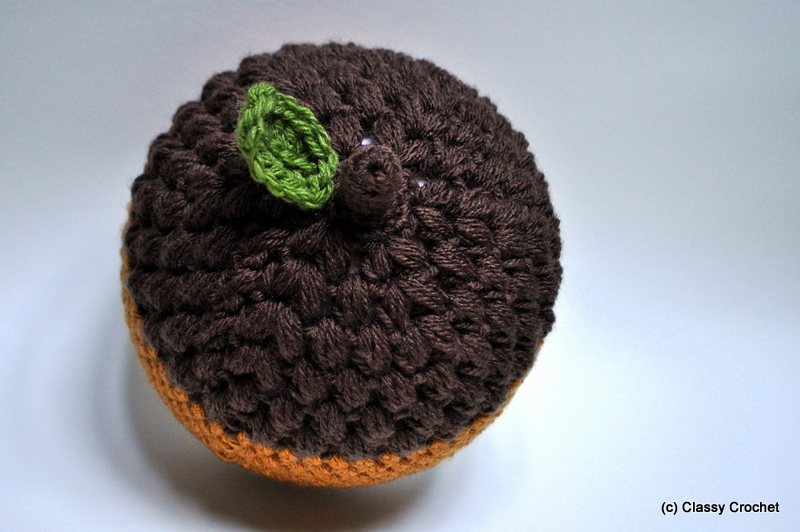 Happy crocheting and as always, if you have any questions or comments, you can email me at classycrochet@gmail.com. 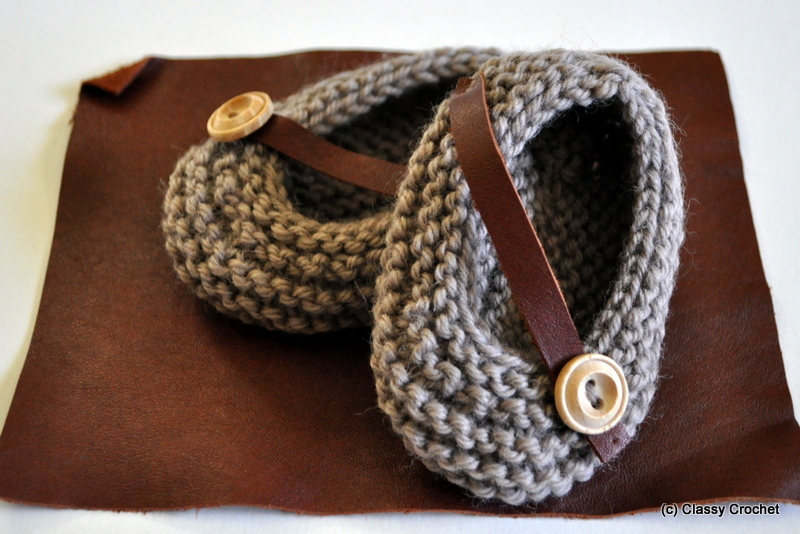 Follow along with the project gallery on Ravelry.